The school houses about 40 floor looms- jack, counterbalance, countermarche, and tapestry. While most weaving is on four to eight shafts, there are occasional 10 and 12 shaft (Macomber looms), 16 shaft (Purrington table loom) and 16 shaft (compudobby) projects. Some looms are historic. The oldest was built by Weaver Rose (William Henry Harrison Rose), probably in the 1890's. He was a Rhode Island handweaver active in the late 19th and early 20th centuries. This loom, a conglomeration of different parts, was reassembled by Norma and her late husband, Andrew Staley, for an exhibit in 1992. She explains Weaver Rose's legacy for contemporary hand weavers and describes the unusual characteristics of this loom. 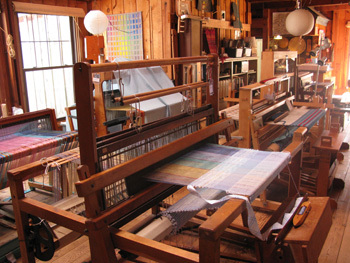 Two looms that belonged to Mary Meigs Atwater were used here for a few years until space in the Handweaving Museum in Clayton, NY became available. Other notable looms include one built by Milo Gallinger for his wife, Osma, a well-known 20th century weaver and teacher, and a loom used in the 1920's in the Bauhaus, where Anni Albers taught. An unusual two-legged loom is being rebuilt for student use.